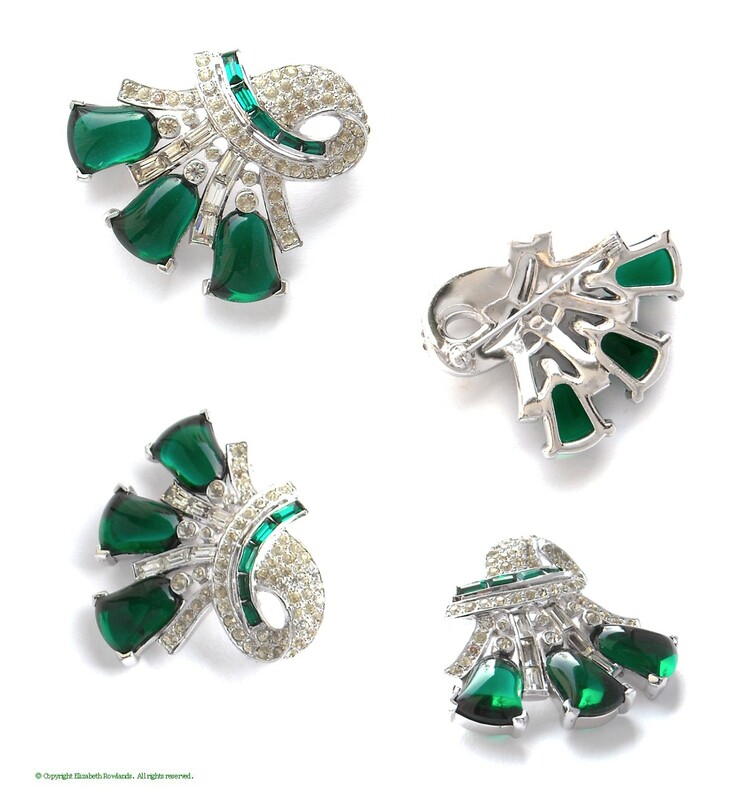 Joseph and Louis Mazer embarked into the jewelry world with their company in 1927. 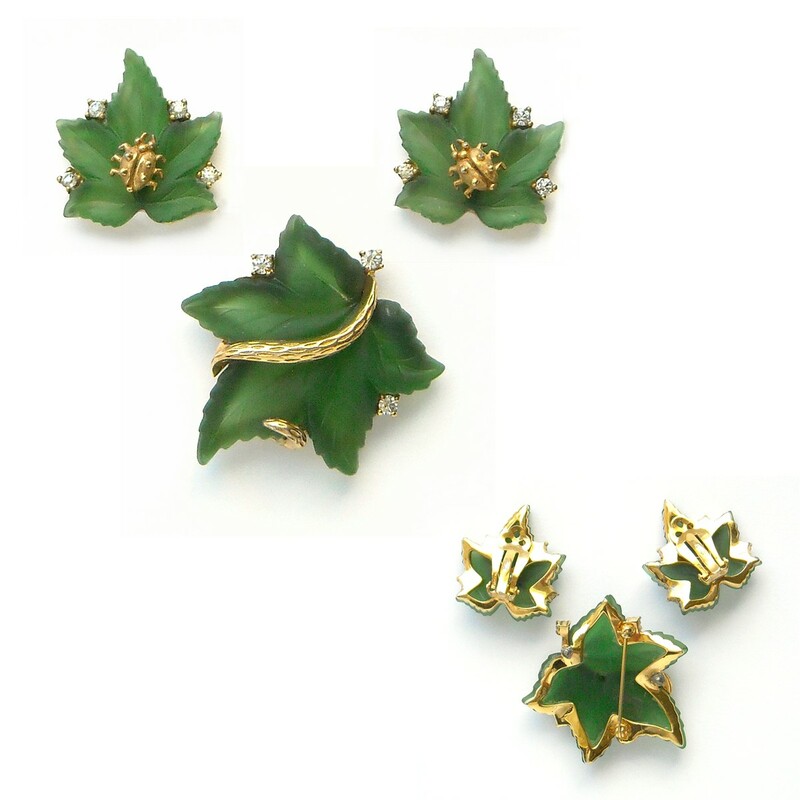 Sometime after World War II, they parted company with Joseph Mazer forming his own company and using the Jomaz mark. Thus, pieces marked Mazer Bros. are those from prior to 1946, while later pieces bear the marks of either Mazer or Jomaz. 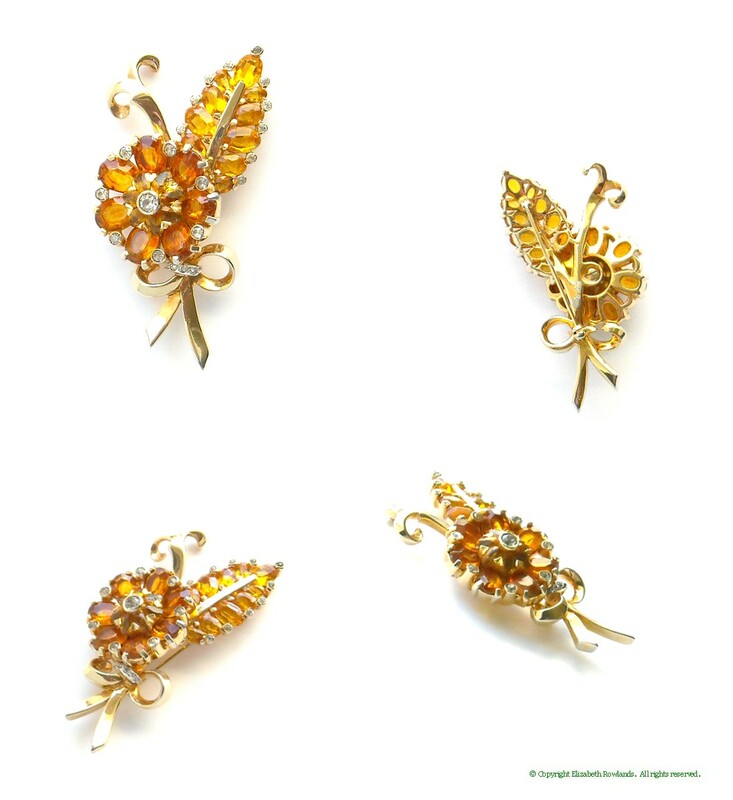 Mazer pieces have always been known for excellence in both workmanship and design. 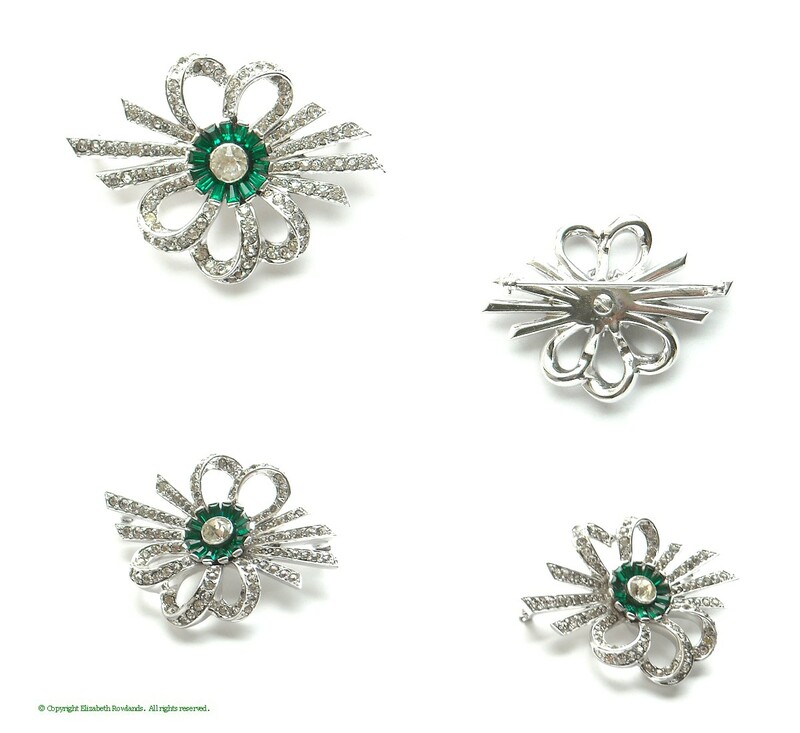 With the look of platinum and diamonds, this charming bow brooch is a dazzler. 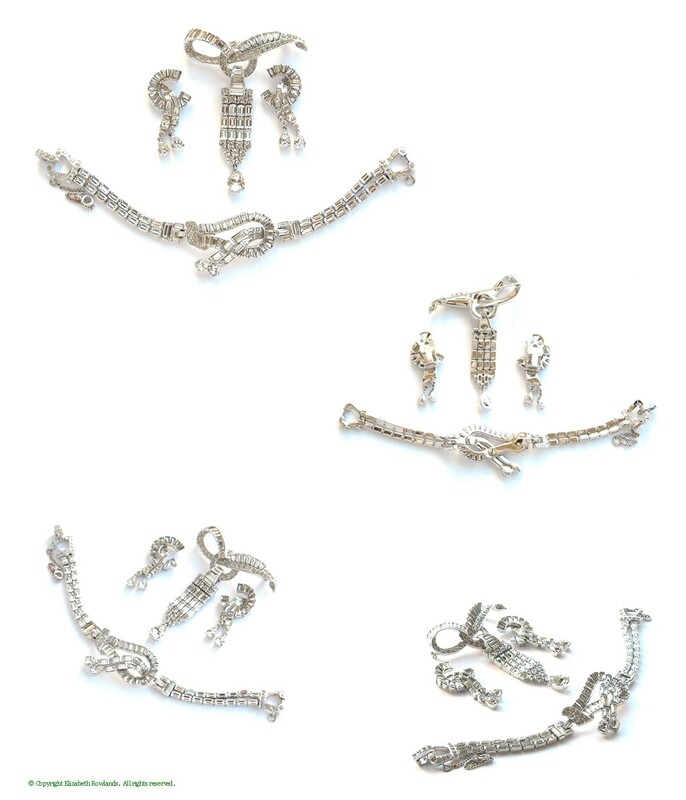 The setting is rhodium plated and this piece is in exceptional condition. Although unsigned, it is identical to the signed Mazer piece, item SM020. 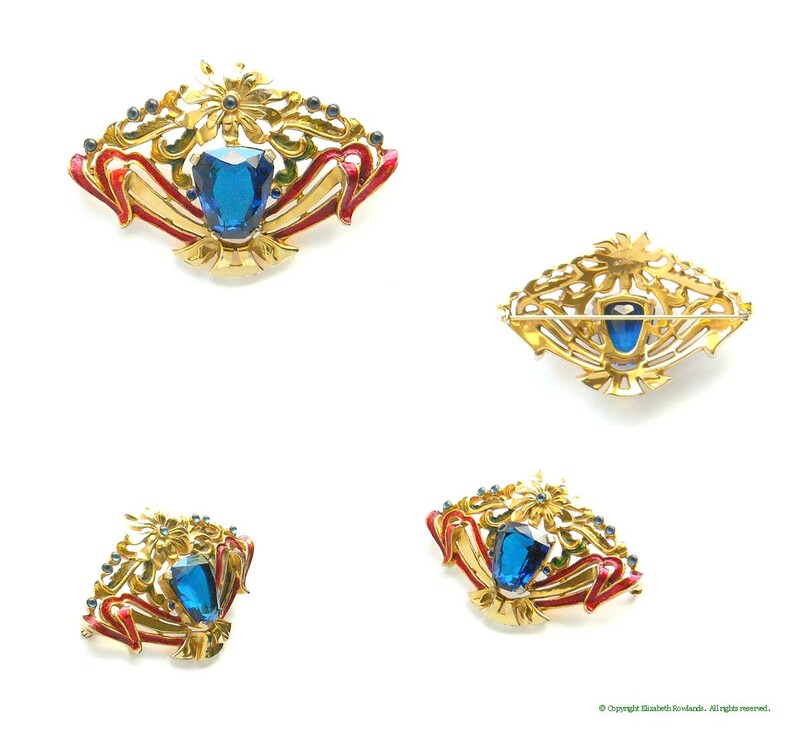 With exquisite design and construction like fine jewelry, this rare coronation orb brooch is a collector's dream. 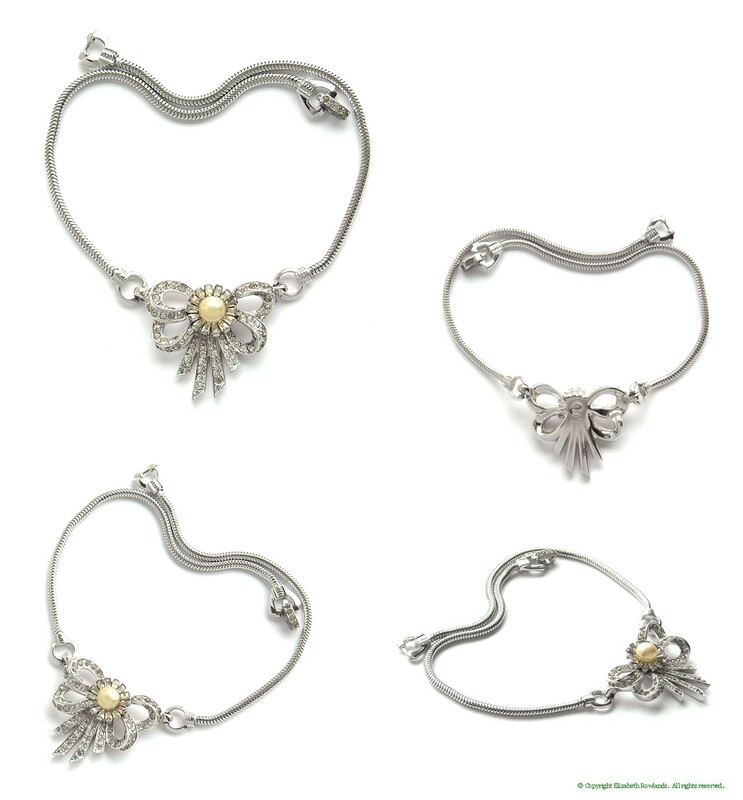 The etched floral pattern on the orb lends a light note to a piece that is a symbol of authority and power. The piece has substantial weight and dimension. 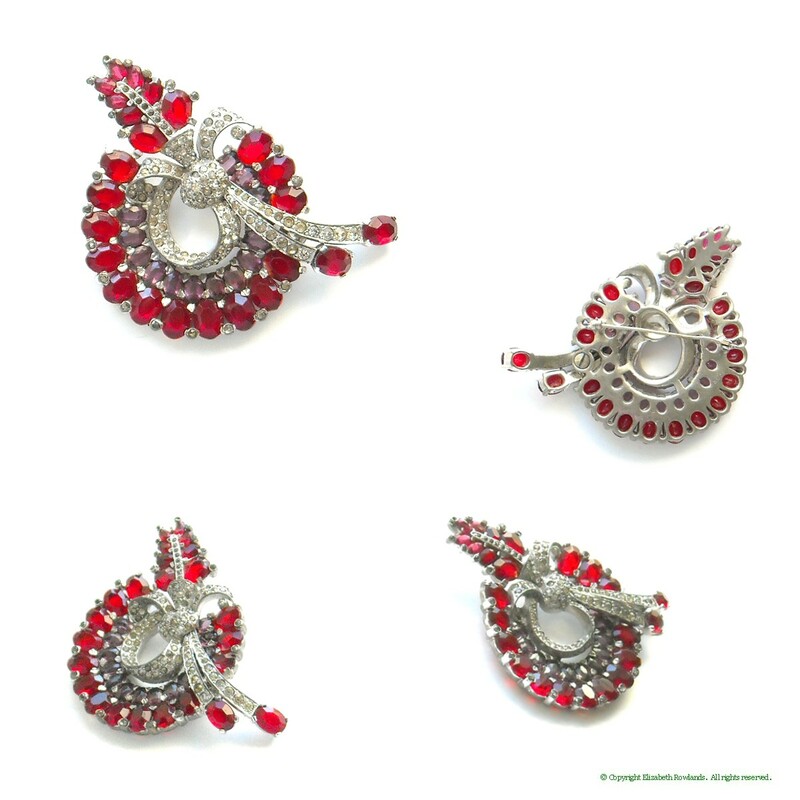 Excellent condition with a few aged tiny rhinestones; ca. 1949. 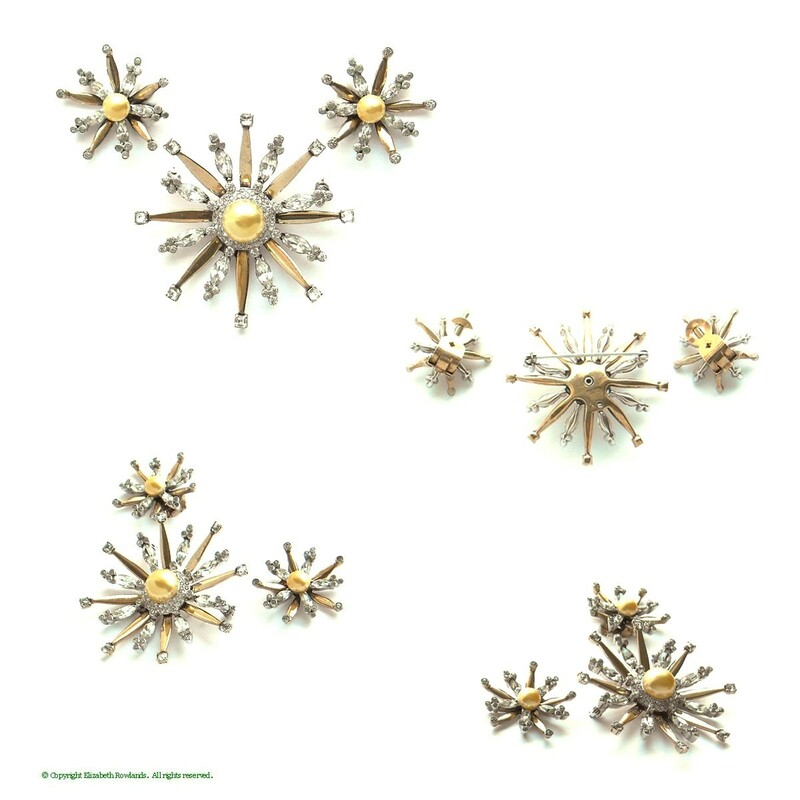 Marked: Mazer Bros.
Brooch: 2" diam., Earrings: 1⅛" diam. 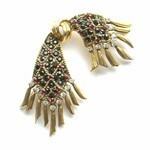 Dazzling and brilliant, this 1940's necklace features a large pear shaped rhinestone flanked with baguettes. 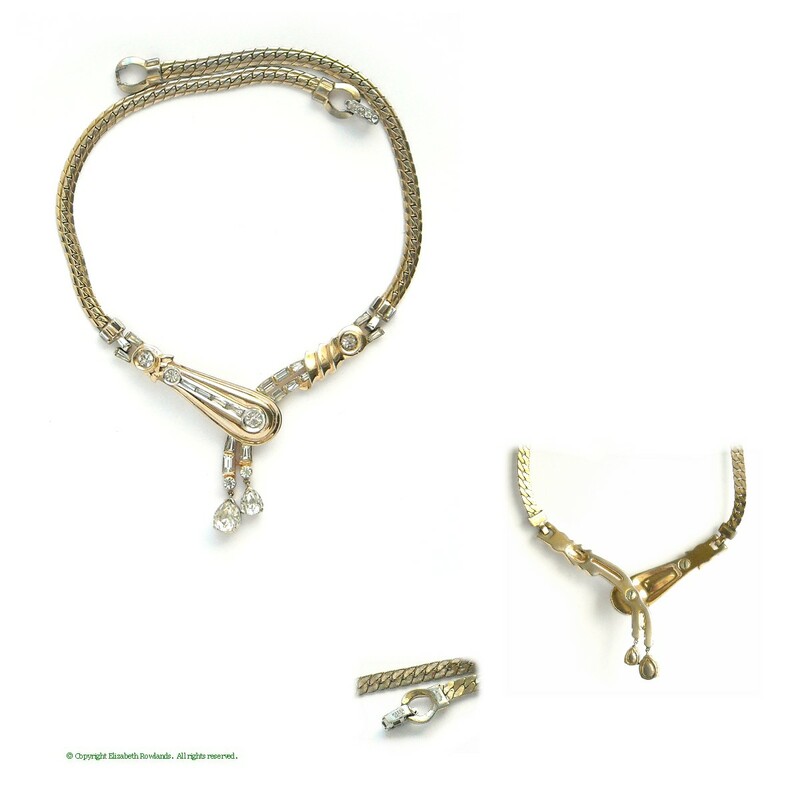 Even the chain is composed of octagon stones for extra sparkle. Marked: Mazer Bros.
A single blossom, but what a lovely one it is! 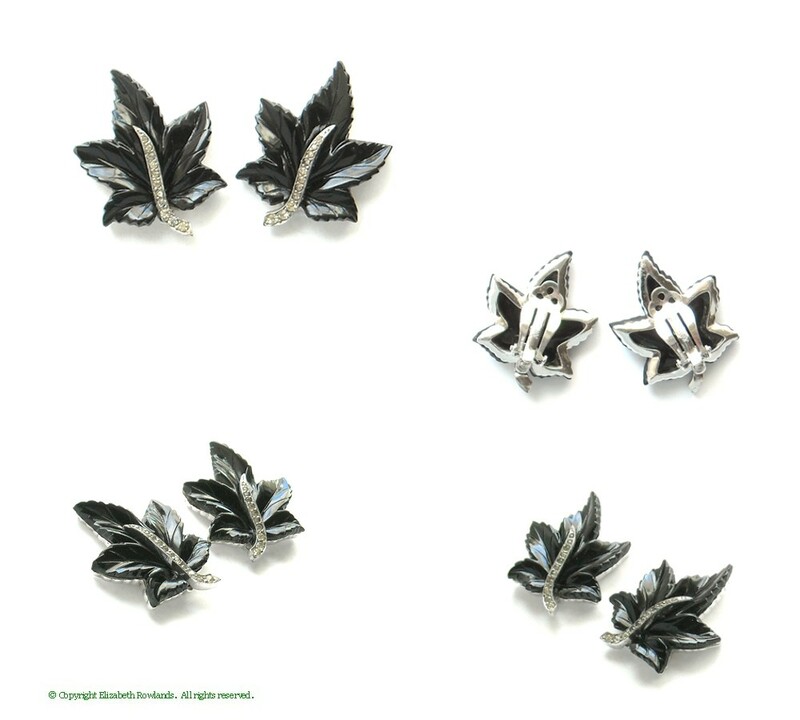 The petals are formed by emerald green tear drop rhinestones. 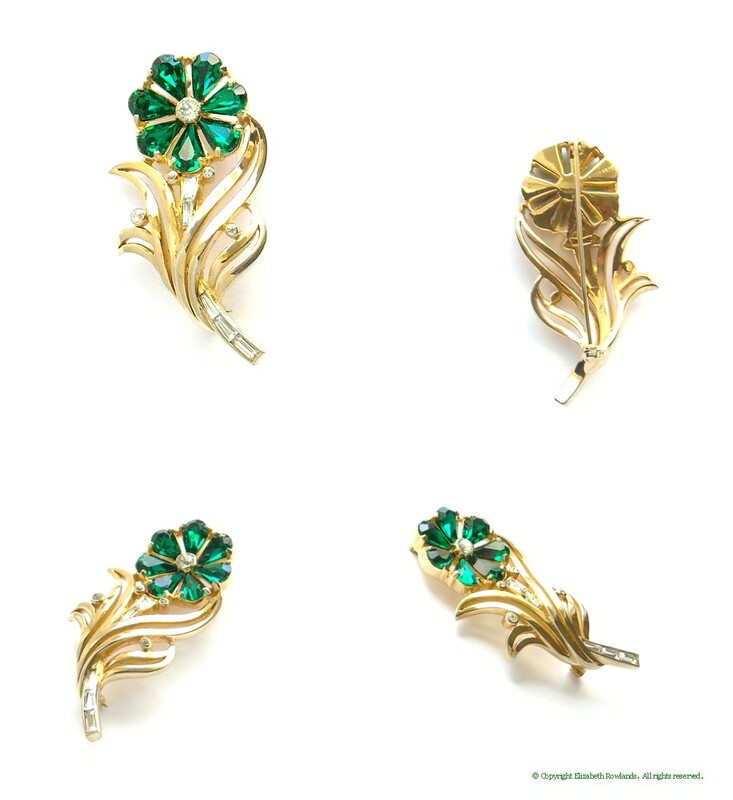 The goldtone stems and leaves are accented with baguettes for added sparkle. Exceptional condition. 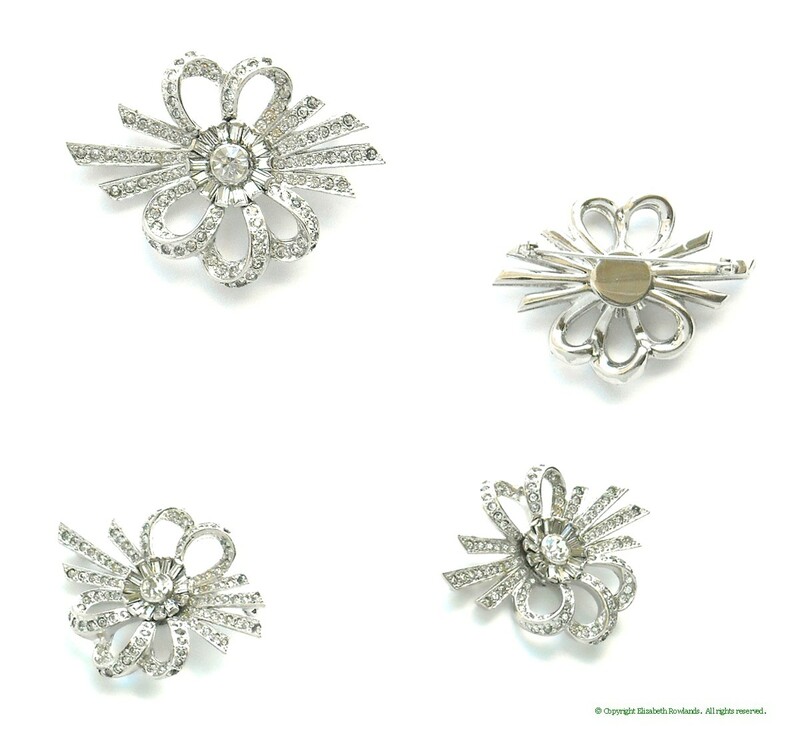 Marked: Mazer Bros.
Brooch: 2½ by 1⅜"; Earrings 1½ by 1¼"
Bracelet: 7¼ by ½"; Earrings: 1 by 1"
These graceful clip earrings show why 1940s styles are timeless. 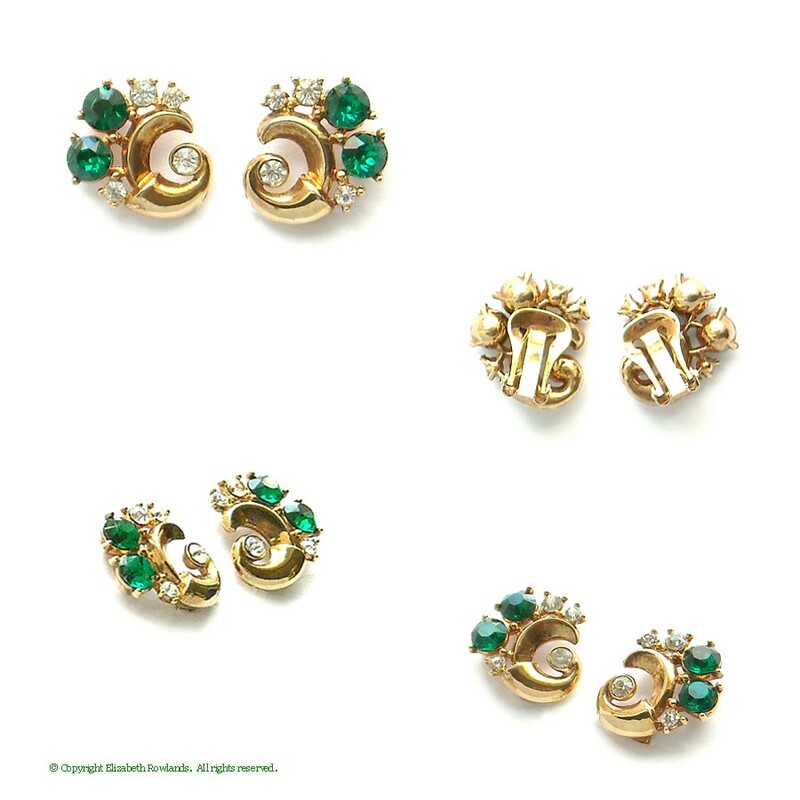 The goldtone swirls embrace emerald green and crystal rhinestones and the condition is excellent. Unmarked, attributed to Mazer from style and construction. Reference: Brunialti, American Costume Jewelry, p. 237. 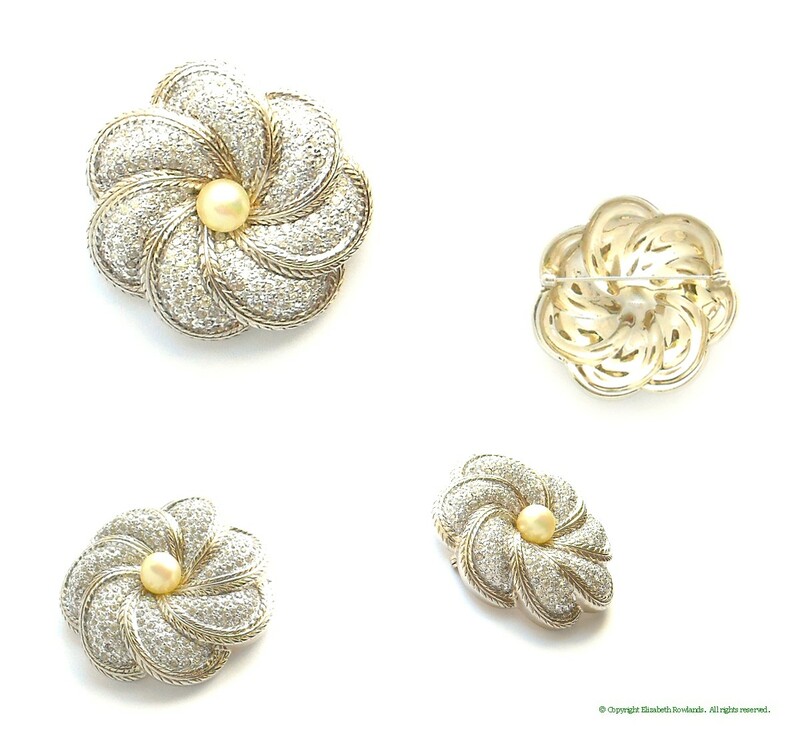 Brooch: 2 by 1¾"; Earrings: 1⅜ by 1¼"
Supreme elegance in a glittering drop style necklace! The central section is rigid and very dimensional, making it difficult to capture, but glorious on. The emerald cut rhinestones continue to the clasp. Click here to see the 1949 ad for a similar piece. Marked: Mazer Bros.
A very special pin from Mazer. 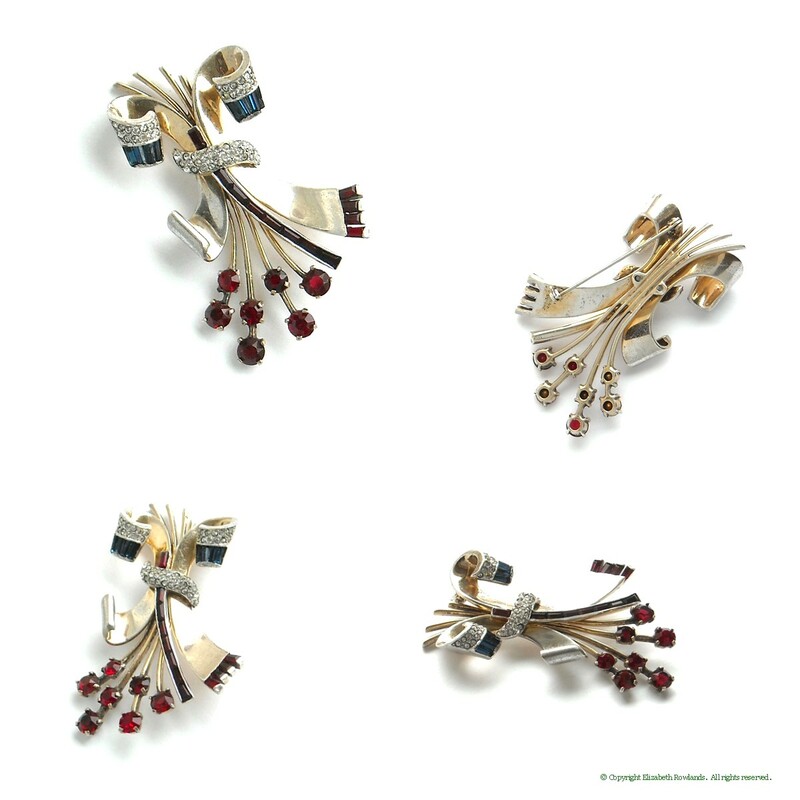 Glowing ruby oval stones and amethyst create a wreath and spray with a pavé ribbon. Pot metal setting with some wear on the pin stem, and the clear stones show some aging. Ribbons of baguettes ending in dangling pear shape stones create a radiant and bewitching design appropriately named "Bagatelle". 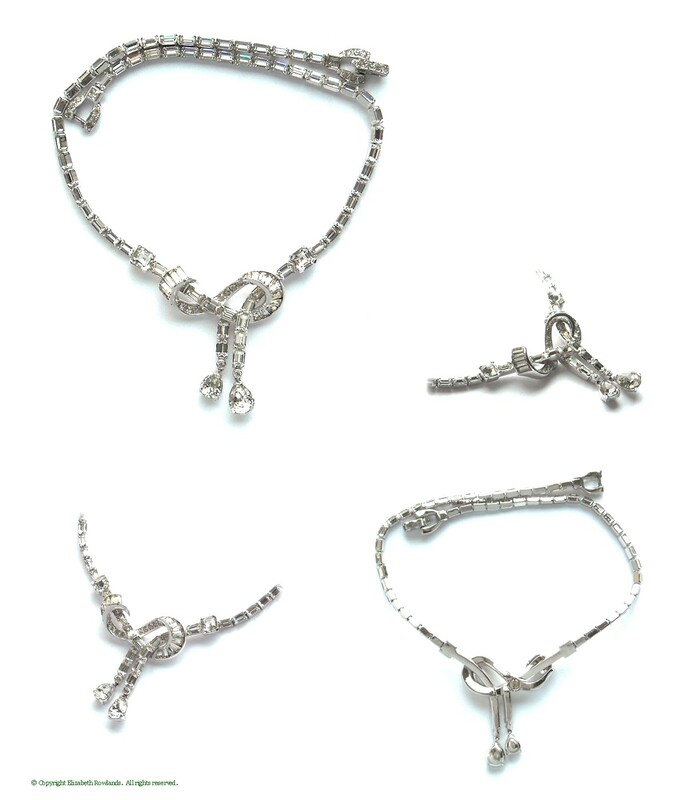 The bracelet echoes the lariat styling of the necklace for this design and the brooch has a flowing cascade of baguettes. Exceptional condition. Marked: Mazer Bros.
Click here for the 1949 ad. 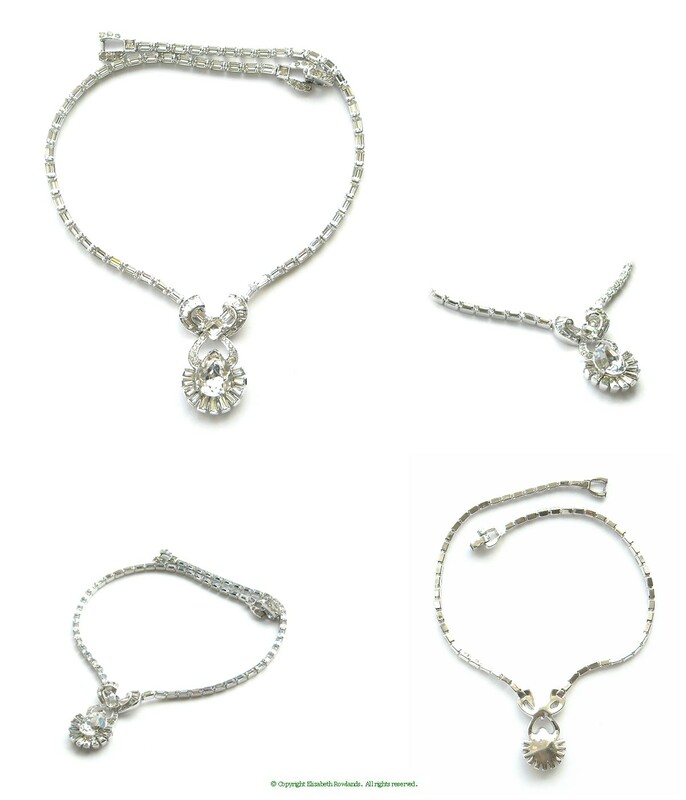 Bracelet: 7¼ by 1¼"; Brooch: 3 by 2¼"; Earrings: 1½ by ¾"
Feminine necklace with that real look. Graduated open backed square faux sapphires curve down to the central navette. 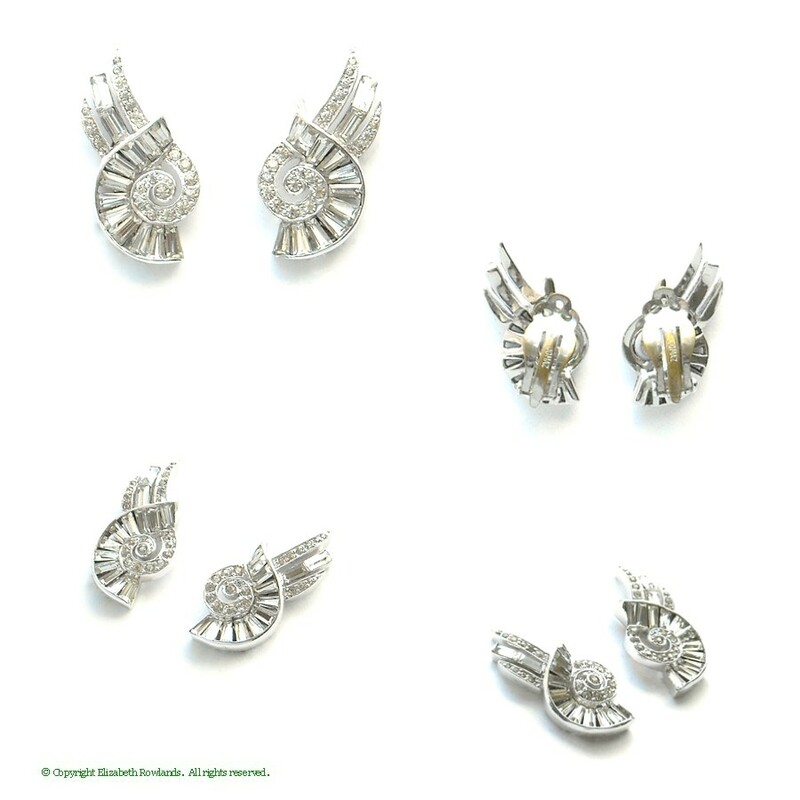 Setting is goldtone with clear rhinestone accents. Simple but very rich looking. Marked: Mazer. Reference: Click here to see the 1949 ad. 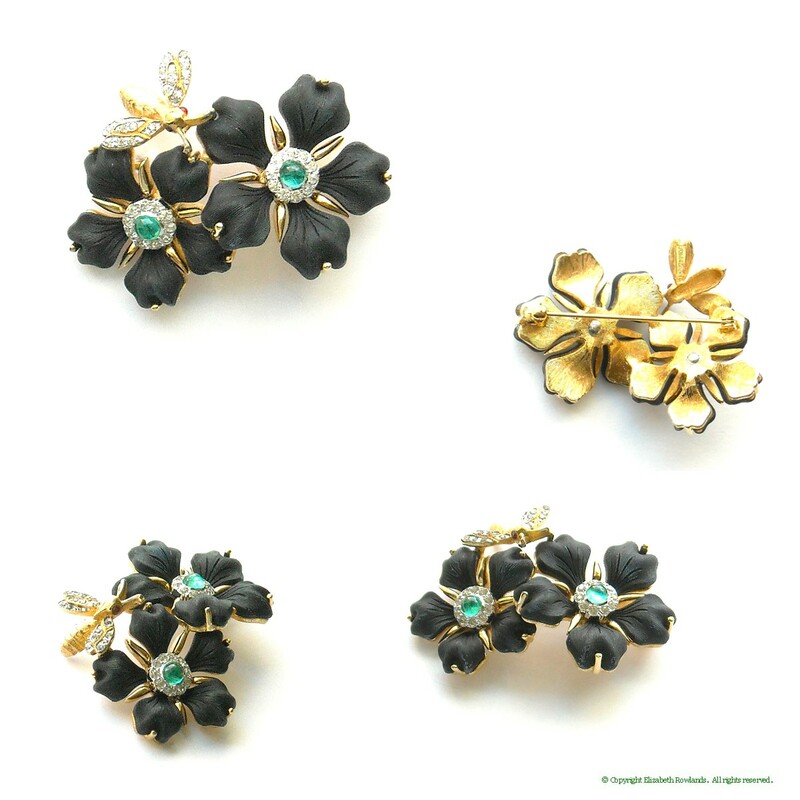 Set with a huge deep blue trapezoid stone, this lovely brooch has tendrils and flowers with enameled ribbons. 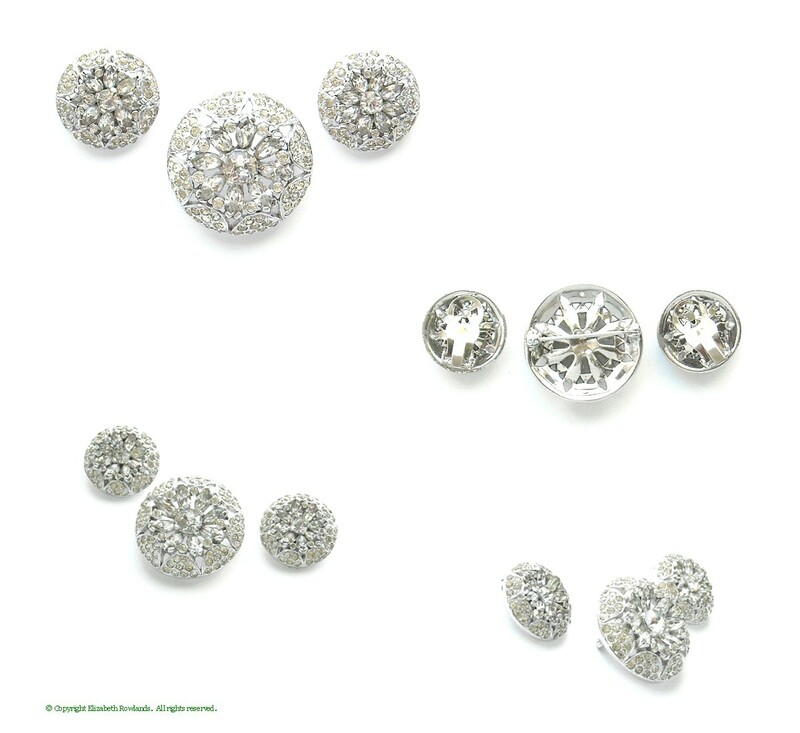 Simulated sapphire cabochons add sparkle. 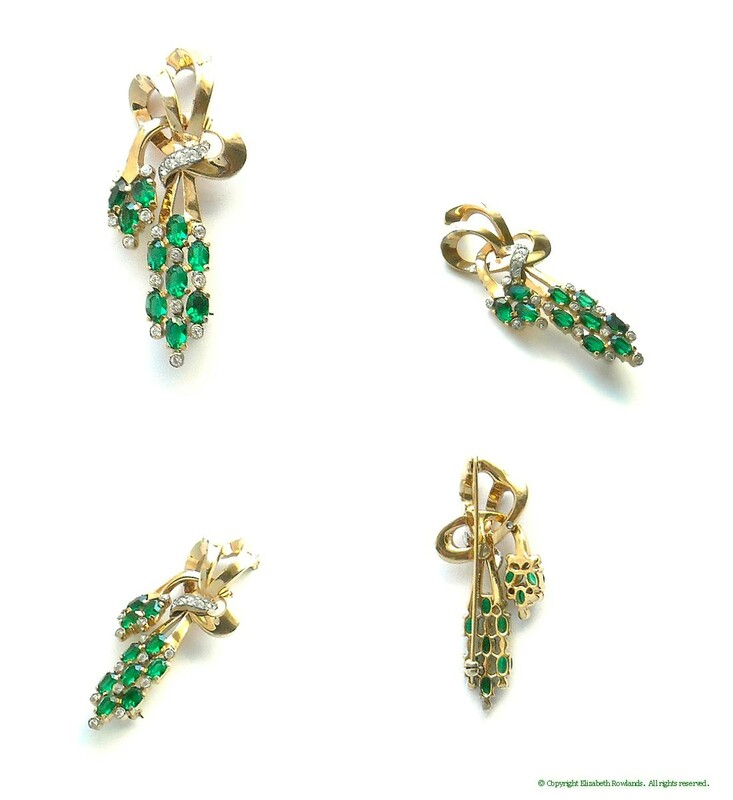 From the late 1930s, this piece is in exceptional condition. 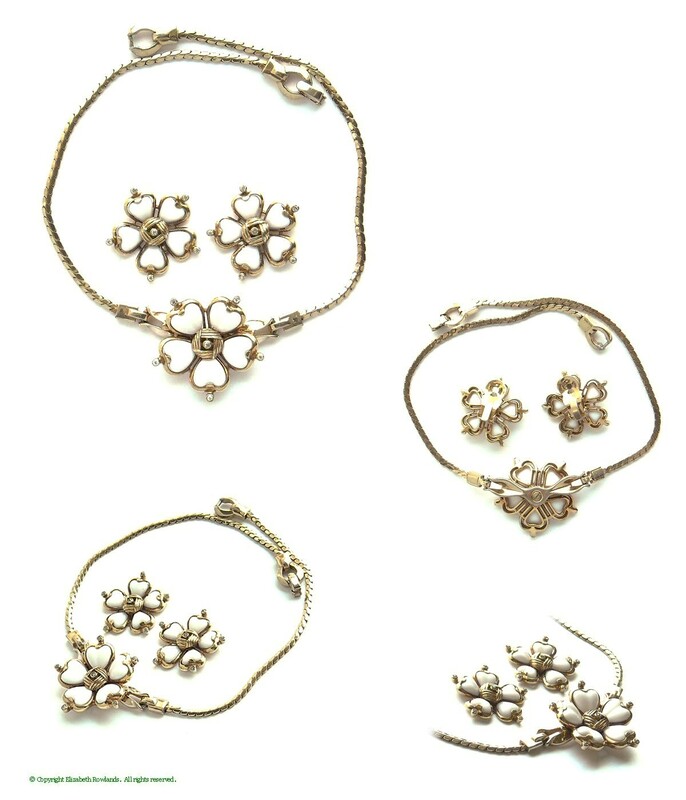 Marked: Mazer Bros.
Summery and fresh, this floral necklace and clip earrings uses white 'milk glass' molded stones for the petals. 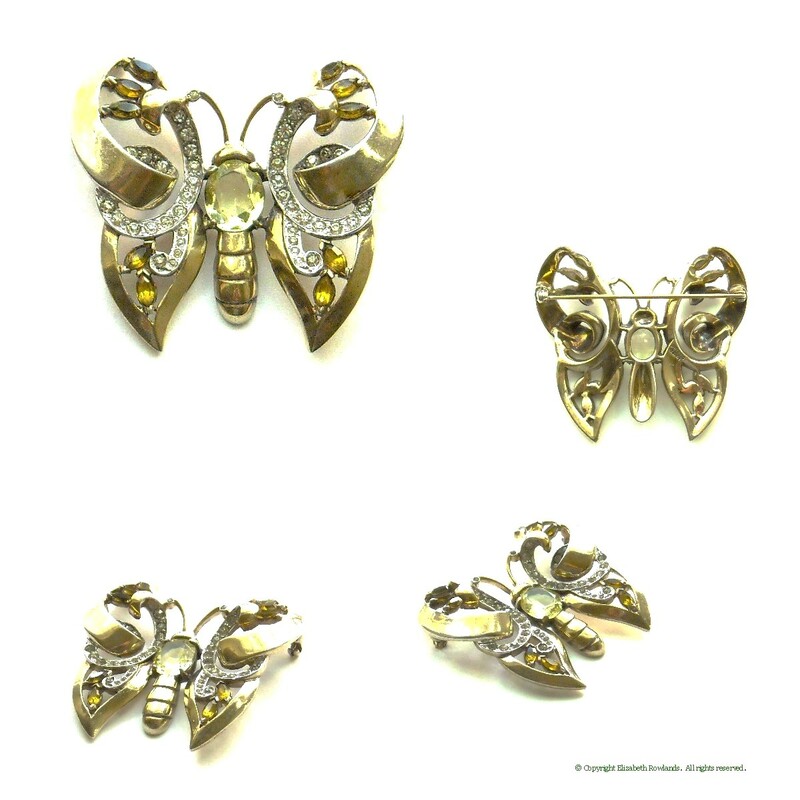 Goldtone settings and rhinestones complete the dimensional look. 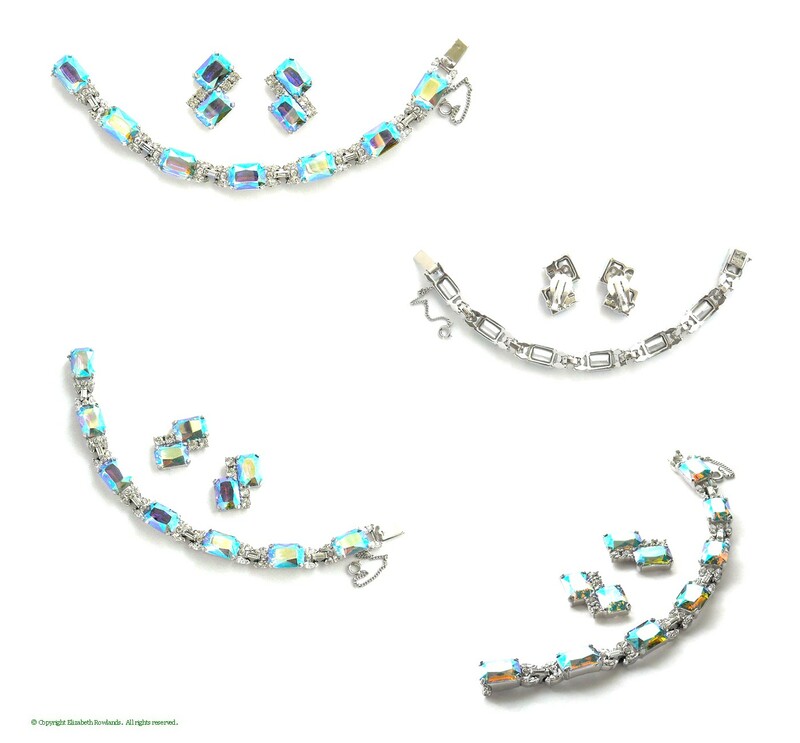 Marked: Mazer Bros.
Necklace: 15½", 1½" drop: Earrings 1¼" diam. 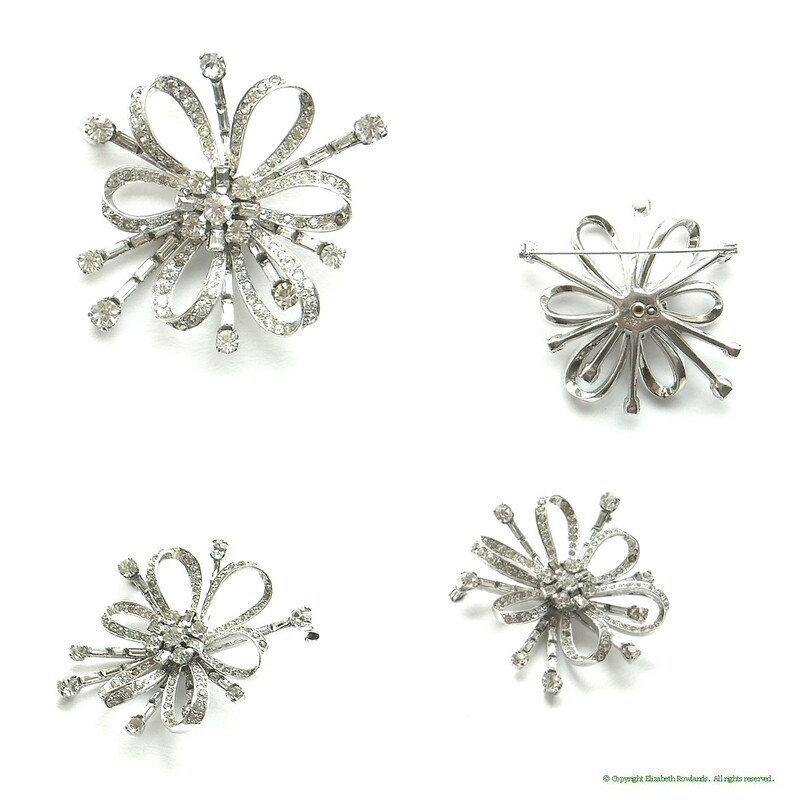 Brooch: 1¼" diam; Earrings: 1" diam. 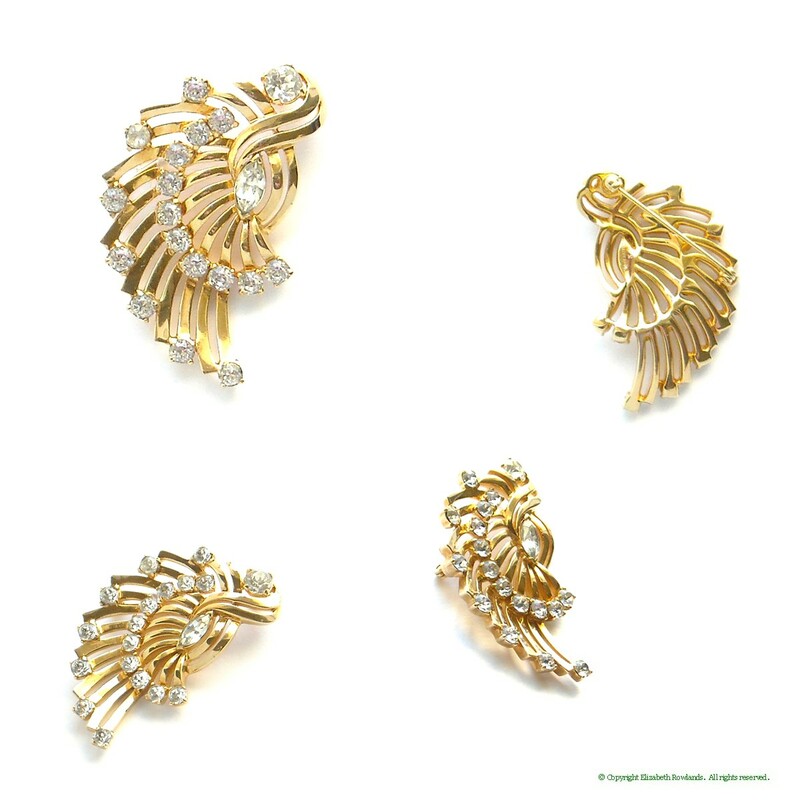 Although abstract in design, this lovely brooch seems to have the look of swirling, loosely knotted ribbons in goldtone with rhinestone accents. Note: there are two very small plating chips on the front, otherwise excellent condition. 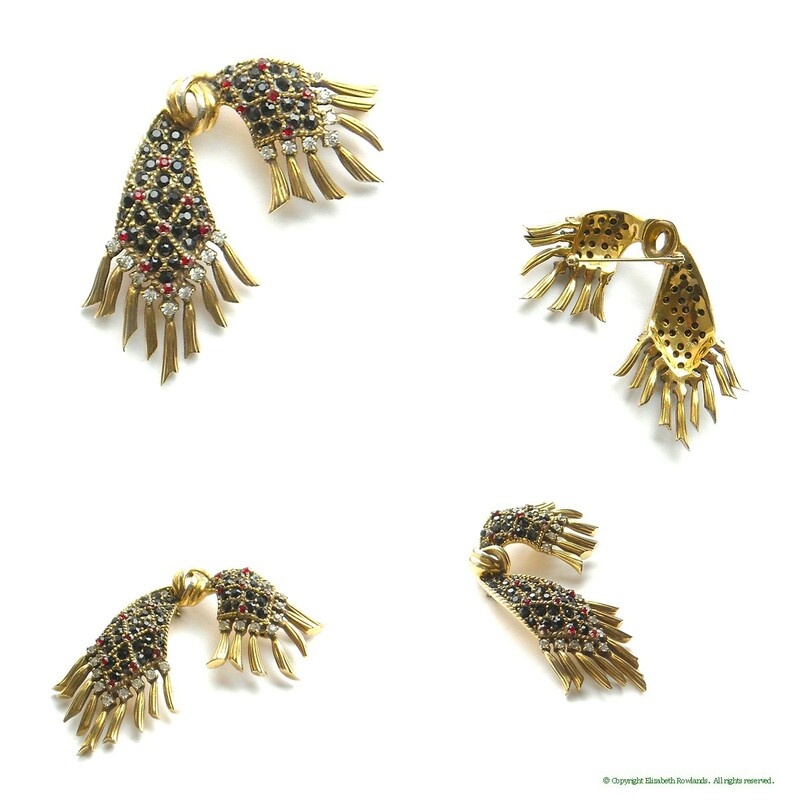 Marked: Mazer Bros.
Brooch: 2¼ by 1½"; Earrings: 1 by ½"
Both architectural and swirling, this unusual design is asymmetrical and stunning on. 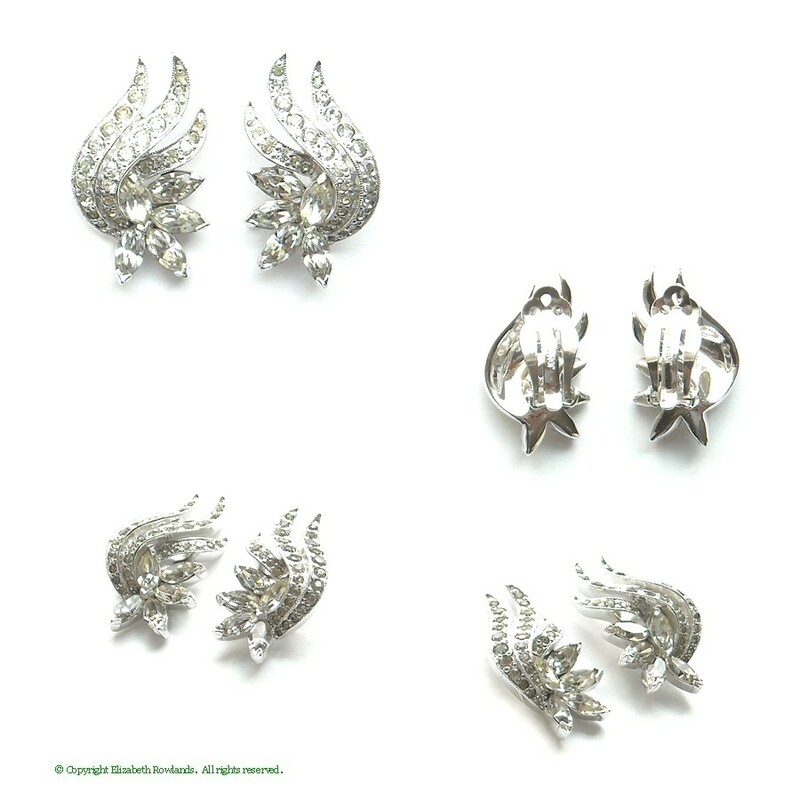 The central section is rigid, enhanced with round and baguette rhinestones and ends with pear shaped dangles. Circa late 1940s. Note: mild wear to the metal finish is reflected in the price. Marked: Mazer Bros.
Reference: Click here for the ad. Delicious central pear shaped stones are magical alexandrite color, changing from lavender to light blue depending on the light source. 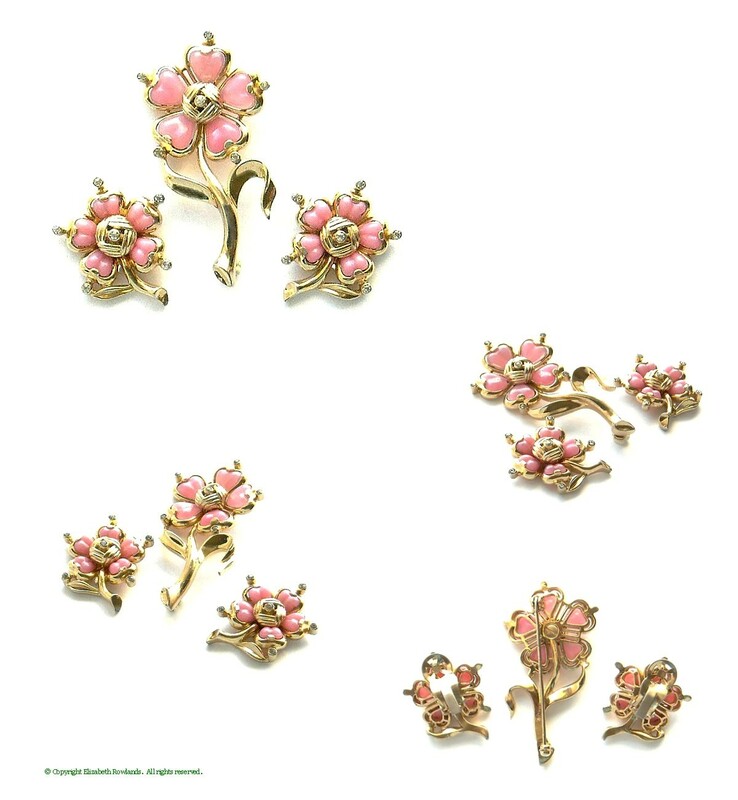 Heavy gold plated metal, clear chatons and baguettes complete the design. Exceptional condition. Marked: Mazer Bros.
1940s styling and in superb condition! 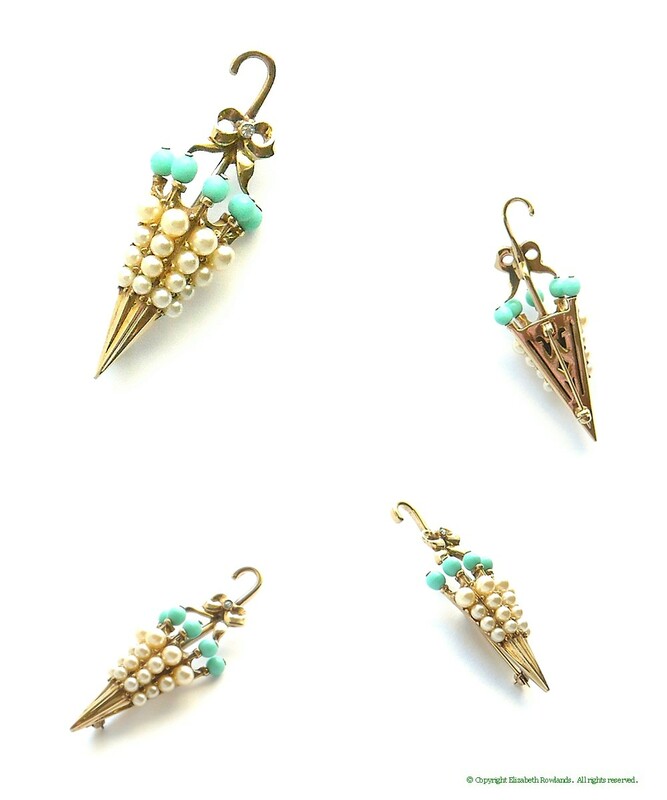 Graceful curves of goldtone with clear rhinestones and oval open-backed aqua stones. 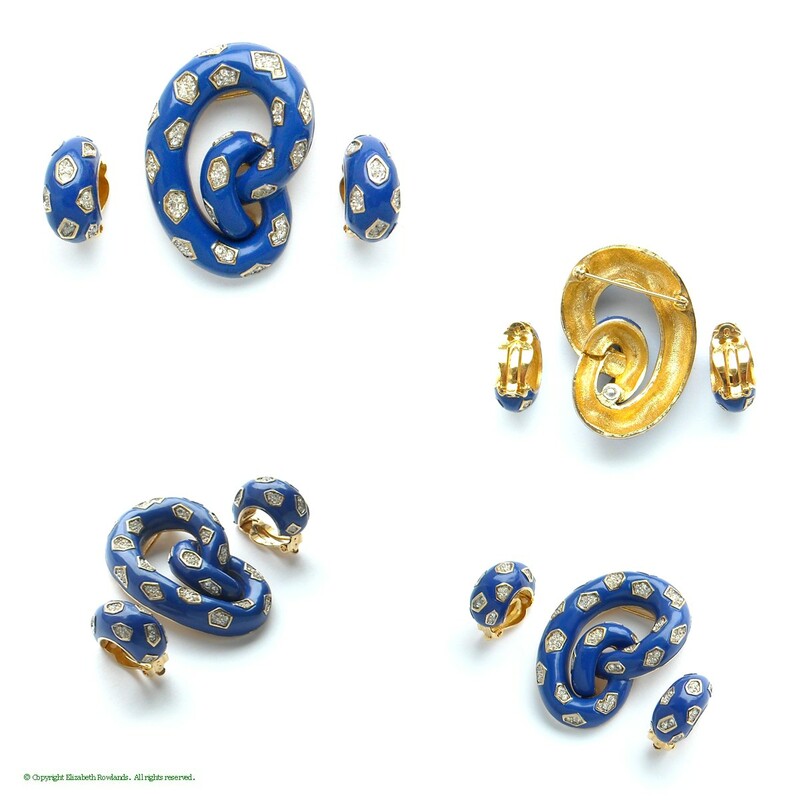 Exceptional design detail, and the earrings have a swirl and stone that curve around from the back clip. (See the full size view for a close-up of the earring.) Very striking on! Marked Mazer. 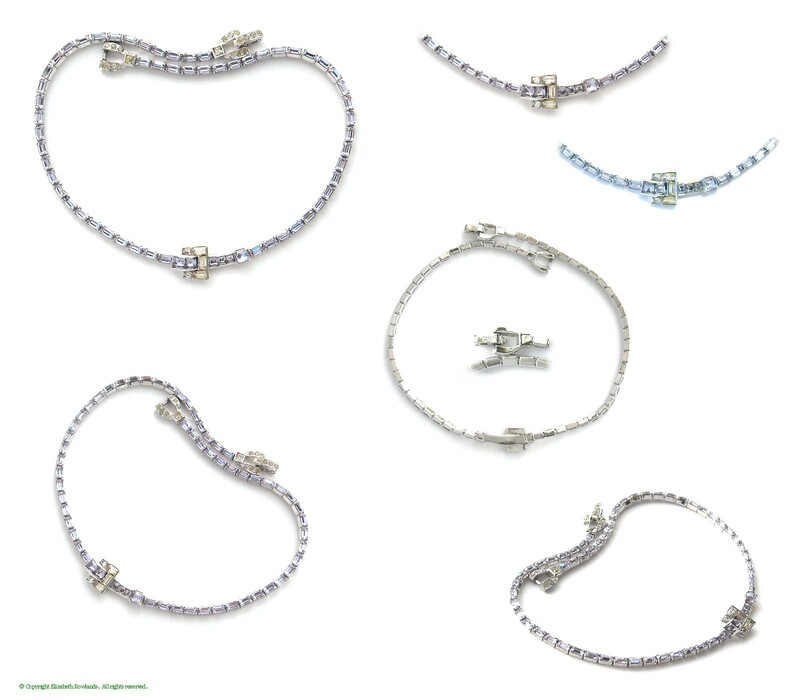 Necklace; 15½" long; 2" drop Earrings: 1¼ by 1"
Bracelet: 7½ by ¾"; Earrings: 1 by 1⅛"